I grew up in a home where wasting food was not tolerated. My Dad would always tell you that there are people out there that have not seen any food to eat and you want to throw food away? He also never liked eating a particular food or soup more than once, so he will always ask me to reconstitute it..maybe add okro to ogbono soup, mix in egusi, turn white rice to jollof, add more crayfish and condiments. My endless kitchen parole for Dad…i can’t even start talking how i felt then, but i am better for it now. I try as much as possible not to waste food if i make too much at a time and this is one of my reconstituted recipes. Looking at the pictures will definitely tell you that this is plain boiled white rice as i purposely left out using curry powder, so as to retain that whiteness (You can see that it coordinates with the vegetables, so colourfree-colourful). If your stew or sauce is not enough for your leftover pot of rice, rather than making a new one, why not make an entirely new dish that will get your family smiling…afterall, who likes having the same food all time. How i ate mine…giving you ideas? Place a pot on fire and pour in the oil. Once heated, add the onions, sausages and carrots to fry together till onions are translucent. Add the rice, pepper and seasonings, then mix together, cover and allow to fry-cook on low-medium. Keep stirring occasionally so that it will not get burnt and also to get the heat circulate through the rice properly. 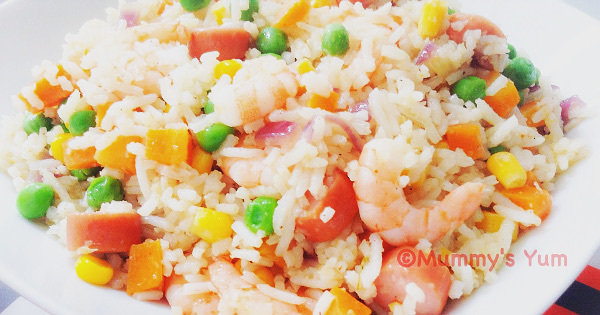 Stir-cook until it is hot, then add the remaining vegetables and cooked prawns or meats. Combine and turn well, check for taste and allow to simmer for about a minute. 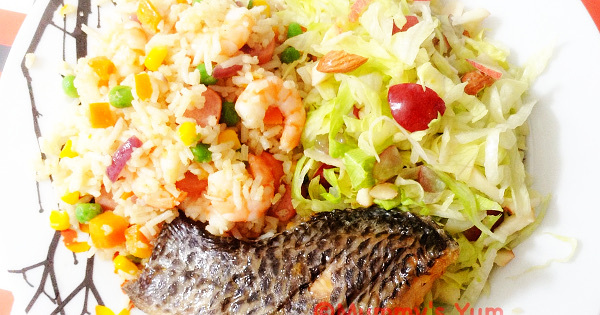 Serve with plantain or salad or just alone. Love this recipe? Give a shout out below, share with friends, like and follow on Facebook, Instagram, Twitter and Pinterest. You can also join the mailing list and receive the weekly newsletter update directly in your email box. Honestly this is just classy. Imagine all these tendencies. Oh dear me! I seriously will try this. LOL. Please do Tendency…it’s a pleasure knowing you.